With Alphacool’s new compression fittings for plexi, brass, borosilicate glass, or carbon tubes, Alphacool is taking another step in the direction of perfection and quality. The first two colours, chrome and deep black, offer a great variety to suit many tastes. The fully coordinated product series gives every system a chance to shine, and the customization options are endless when paired with Alphacool plexi-brass tubes! A new chromatization technique binds the colouring tightly to the brass surface. This improves the longevity of the intense colour and prevents any chipping of the chrome layer. Blue Alphacool lettering on some of the connectors also highlights the uniqueness of these parts. 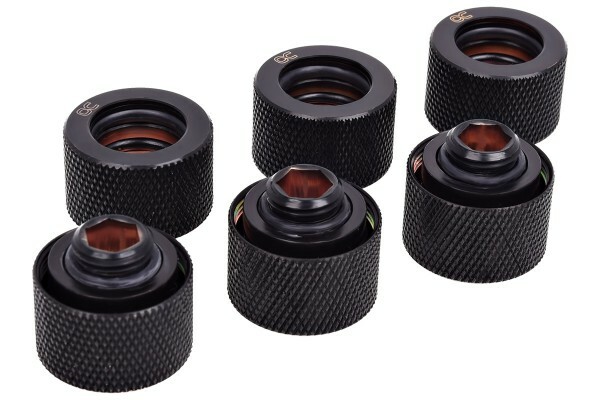 This connector can be used to connect a 16mm plexi, brass, borosilicate glass, or carbon tube to a G1/4" thread. Since six connectors of one kind are often necessary, Alphacool is now offering Sixpacks. This has a lot of advantages for you! Here you will receive 6 HardTube fittings complete. Kann man diese Anschlüsse auch für 16/12 Tubes verwenden oder spielt der Innendurchmesser tatsächlich auch eine Rolle? Nein, der Innendurchmesser des HardTubes spielt keine Rolle, daher können sie auch HArdTubes mit 12mm Innendurchmesser verwenden.